RENO, Nev.--(BUSINESS WIRE)--INTERBIKE – Booth #2341 – Pioneer Electronics (USA) Inc.’s Cycle Sports Division today introduces the new Pioneer® SBT91 Series Dual Leg and Single Leg Pedaling Monitor Power Meters compatible with the flagship Shimano® DURA-ACE® R9100 HOLLOWTECH® II crankset and the Pioneer SBT80 Series Dual Leg and Single Leg Pedaling Monitor Power Meters compatible with Shimano ULTEGRA® R8000 HOLLOWTECH® II crankset. 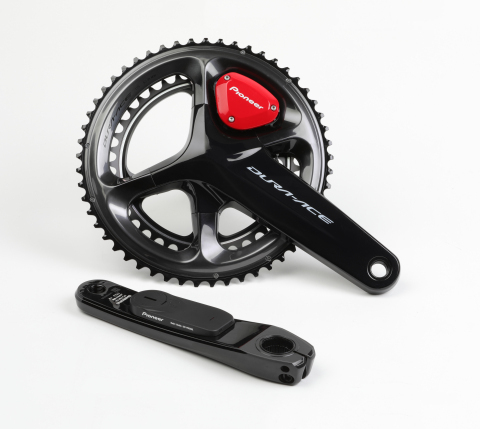 The new 2018 power meters integrate advanced Bluetooth® Low Energy technology to support smartphone connectivity for riders to access Pioneer’s new Cyclo-Sphere Control smart device application created to simplify power meter set-up, maintenance and firmware updates. The app also offers the Live Pedaling feature that enables a rider to view Pioneer’s proprietary Pedaling Monitor power metrics, including force vectors, torque chart and pedaling efficiency in real-time on a compatible smart device, before only viewable on a Pioneer cycle computer. Integrated Bluetooth Smart Sensors transmit power metrics from the power meter to Bluetooth-enabled cycle computers, smart trainers and cycling programs such as Zwift®. The left arm chassis on the 2018 power meters has also been redesigned to increase bike compatibility, including Trek™ bicycles. for Pioneer Electronics (USA) Inc.